This 300 ml PFI-207BK Black Ink Cartridge from Canon is designed for the imagePROGRAF iPF680, iPF685, iPF780, and iPF785 printers. It is a dye-based ink featuring Canon's Reactive Ink Technology. This technology results in ink formulated to maximize ink adhesion to the media for creating clear fine lines and details, ideal for AEC, CAD, and GIS documents. This 300 ml PFI-207C Cyan Ink Cartridge from Canon is designed for the imagePROGRAF iPF680, iPF685, iPF780, and iPF785 printers. It is a dye-based ink featuring Canon's Reactive Ink Technology. 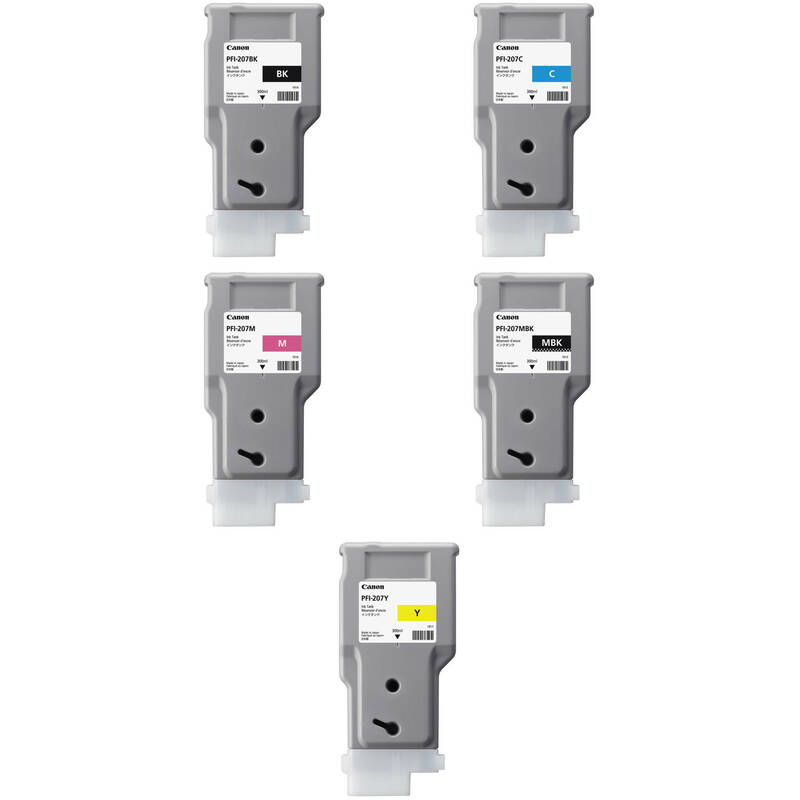 This technology results in ink formulated to maximize ink adhesion to the media for creating clear fine lines and details, ideal for AEC, CAD, and GIS documents. This 300 ml PFI-207M Magenta Ink Cartridge from Canon is designed for the imagePROGRAF iPF680, iPF685, iPF780, and iPF785 printers. It is a dye-based ink featuring Canon's Reactive Ink Technology. This technology results in ink formulated to maximize ink adhesion to the media for creating clear fine lines and details, ideal for AEC, CAD, and GIS documents. This 300 ml PFI-207MBK Matte Black Ink Cartridge from Canon is designed for the imagePROGRAF iPF680, iPF685, iPF780, and iPF785 printers. It is a pigment-based ink featuring Canon's Reactive Ink Technology. This technology results in ink formulated to maximize ink adhesion to the media for creating clear fine lines and details, ideal for AEC, CAD, and GIS documents. This 300 ml PFI-207Y Yellow Ink Cartridge from Canon is designed for the imagePROGRAF iPF680, iPF685, iPF780, and iPF785 printers. It is a dye-based ink featuring Canon's Reactive Ink Technology. This technology results in ink formulated to maximize ink adhesion to the media for creating clear fine lines and details, ideal for AEC, CAD, and GIS documents. Box Dimensions (LxWxH) 8.65 x 3.65 x 1.7"
Box Dimensions (LxWxH) 8.8 x 3.7 x 1.4"
Box Dimensions (LxWxH) 8.55 x 3.65 x 1.4"
Box Dimensions (LxWxH) 8.9 x 3.65 x 1.4"
Box Dimensions (LxWxH) 9.25 x 3.75 x 1.4"